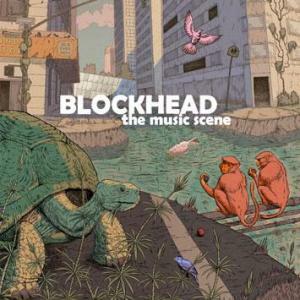 Aesop Rock’s longtime collaborator Blockhead has released his fourth album, The Music Scene. Earlier this month, Ninja Tune posted a digital version for sale on its website (as well as retailers such as Amazon and eMusic); the CD and vinyl editions drop on January 12. New York hip hop producer Tony Simon aka Blockhead returns with his third and best instrumental album for Ninja Tune. While “The Music Scene” represents a development in Blockhead’s work, he still holds true to his basic beliefs about music and rhythm. When not working on his new album he has been providing production for Aesop Rock, DJ Signify, Joanna Erdos and many more, plus remixes for Yameen and Chin Chin, amonst others. Whereas the music scene is “a bastardized version of something that was already watered down,” Blockhead’s “The Music Scene,” like his career as a whole, is “the opposite of that.” By re-working, chopping and melding samples, by blending them together, Blockhead restores rather than dilutes their purity. This entry was posted in News and tagged Blockhead, Ninja Tune. Bookmark the permalink.